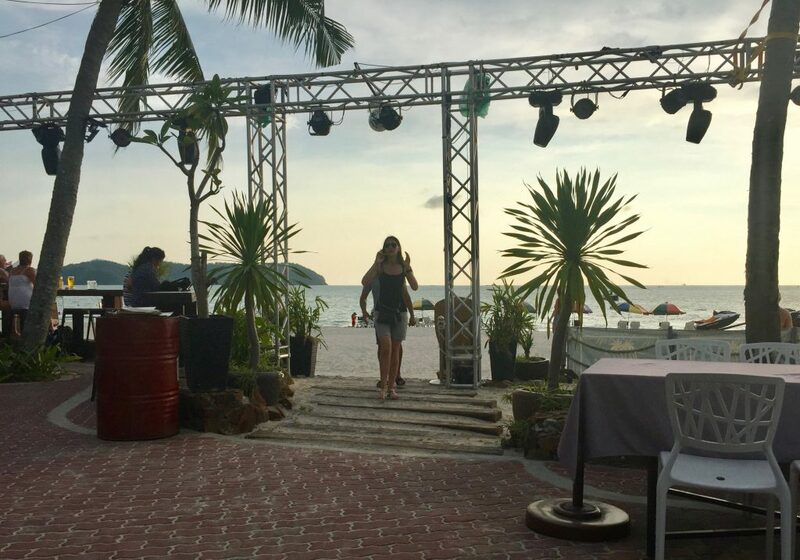 Sunset over Nai Harn Bay from the Phuket Yacht Club. 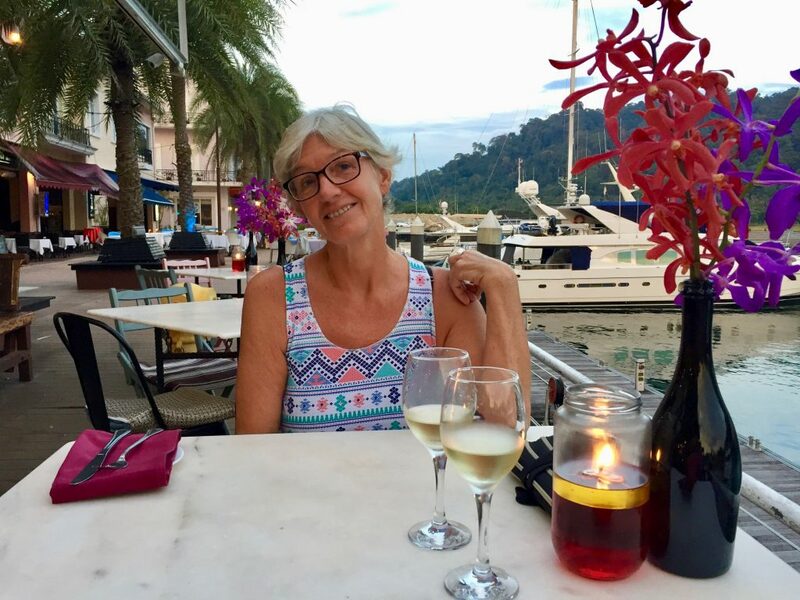 After Michelle left for Australia, we stayed on at anchor at Nai Harn Beach, which was well sheltered from the weeklong strong northerly winds. 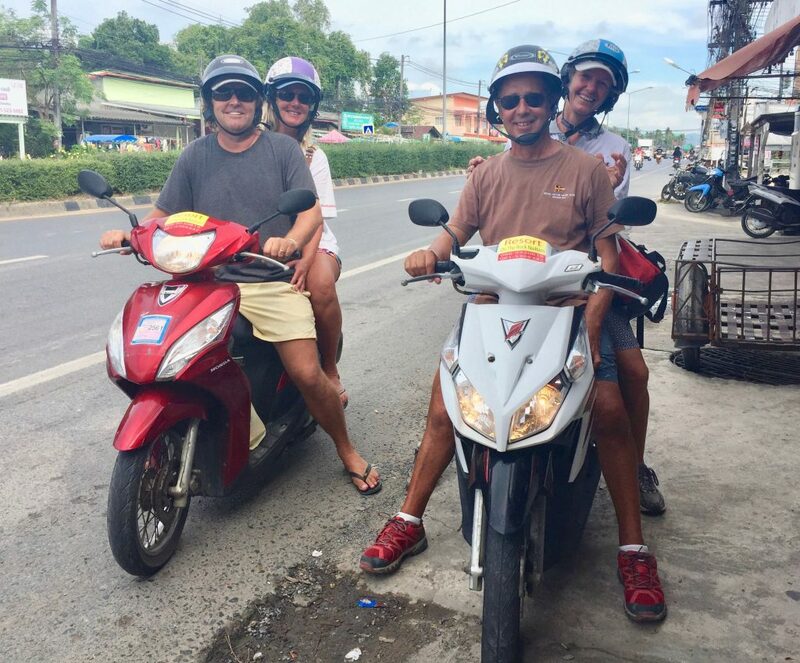 We did daily walks and took the opportunity to explore Phuket by rented car and mopeds. 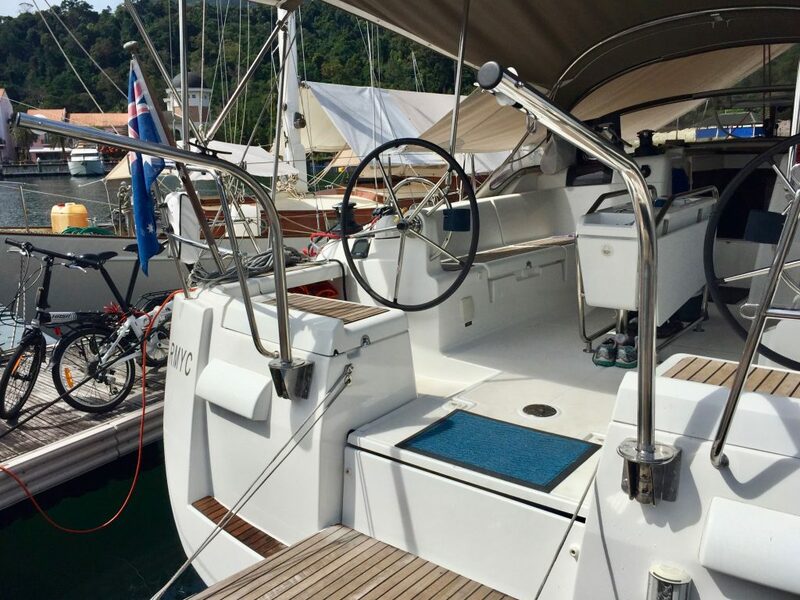 The car was necessary to collect boat spares at Boat Lagoon Marina and our new davits from Scotland, at a post office north of the town. 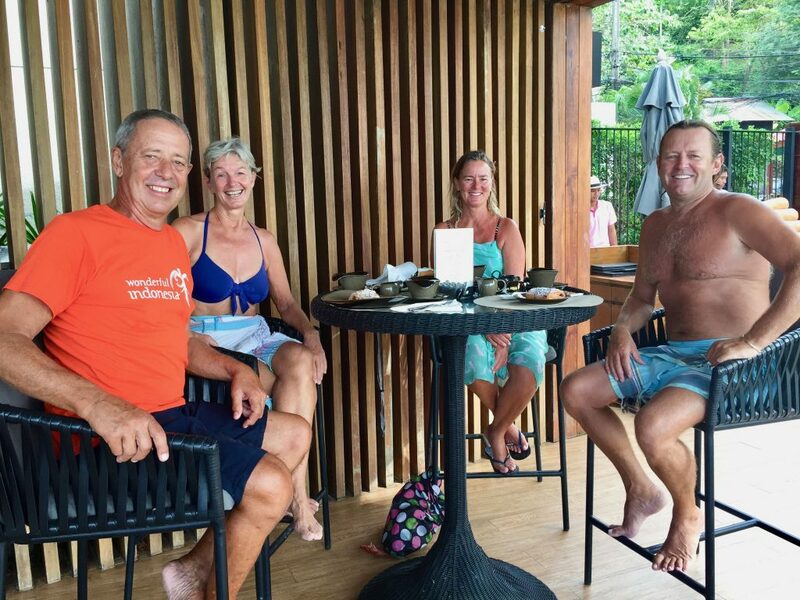 Coffee and croissants after a morning walk with Mike and Debi from Cape Town. Budgie smugglers rule! The wife of the bloke on the right, slapped him with a wet copy of the Women’s Weekly. Christmas day coincided with Mike Kruyt’s birthday. 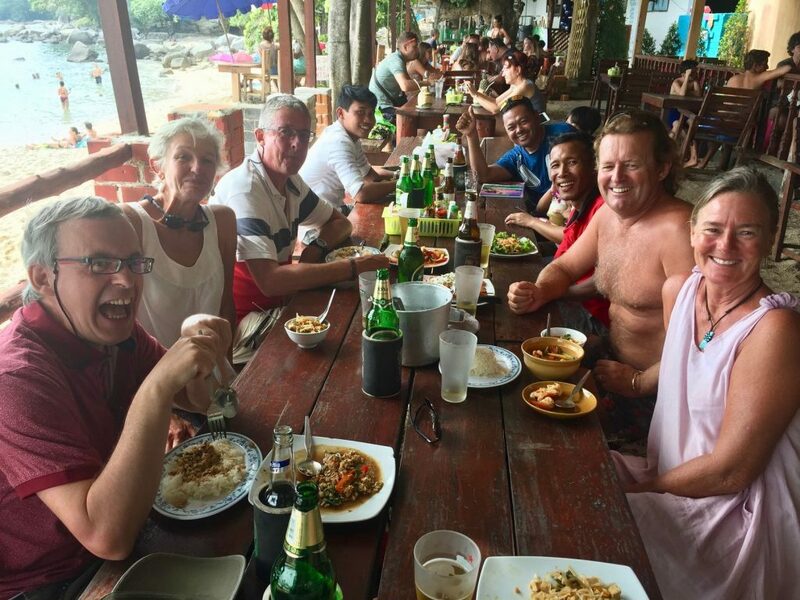 We had a jovial group of friends celebrating at a Christmas lunch on the beach. New Year’s eve arrived and we had dinner with friends from the UK and Holland before settling on Esprit with drinks, to see in the New Year and celebrate Annie’s birthday. The locals put on quite a spectacular but un-coordinated fireworks display on the beach. It started at at 11:30pm and sporadically carried on until 2am! Great fun. 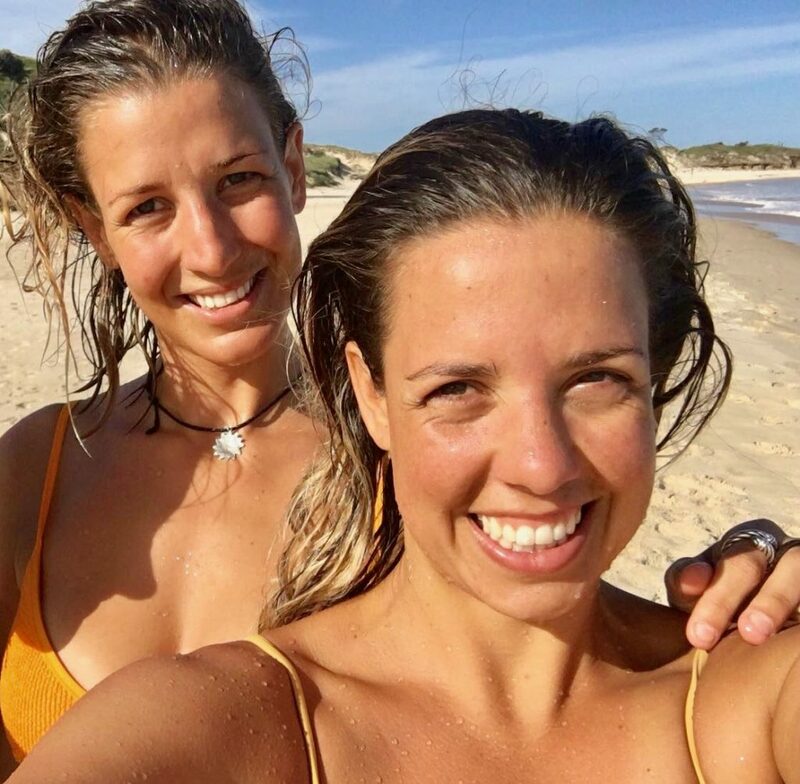 Michelle and Karen – Christmas day at Byron Bay. 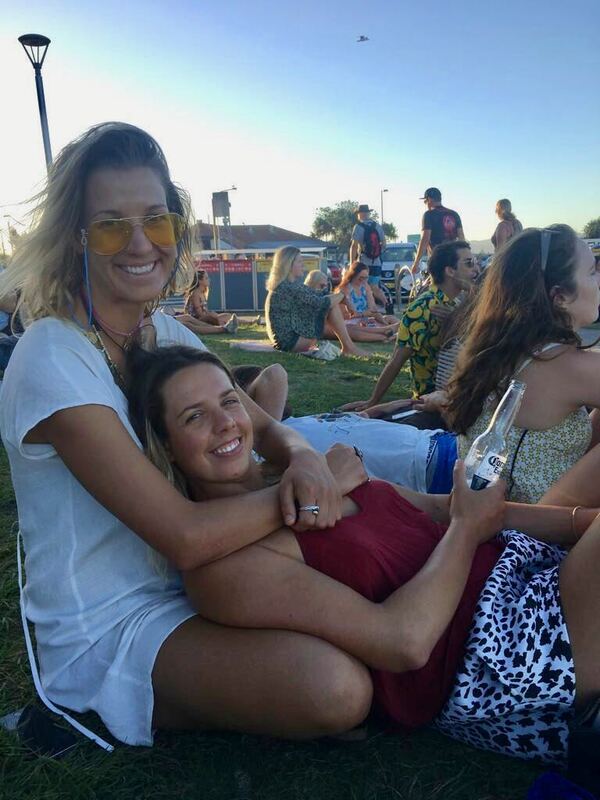 Michelle & Karen: New Year’s day music festival at Wisemans ferry. 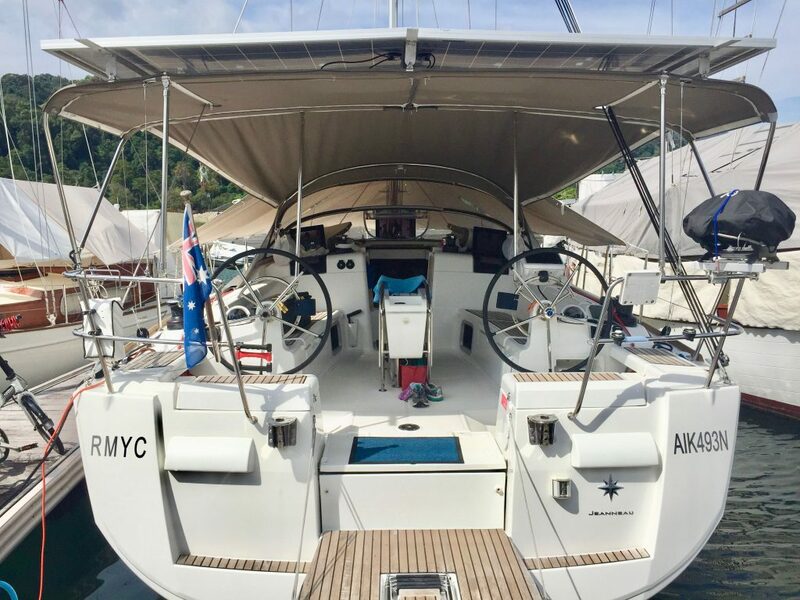 We set sail back to Langkawi on the 3rd January and had a leisurely sail visiting islands enroute, on the 3-day journey back to Rebak Marina. 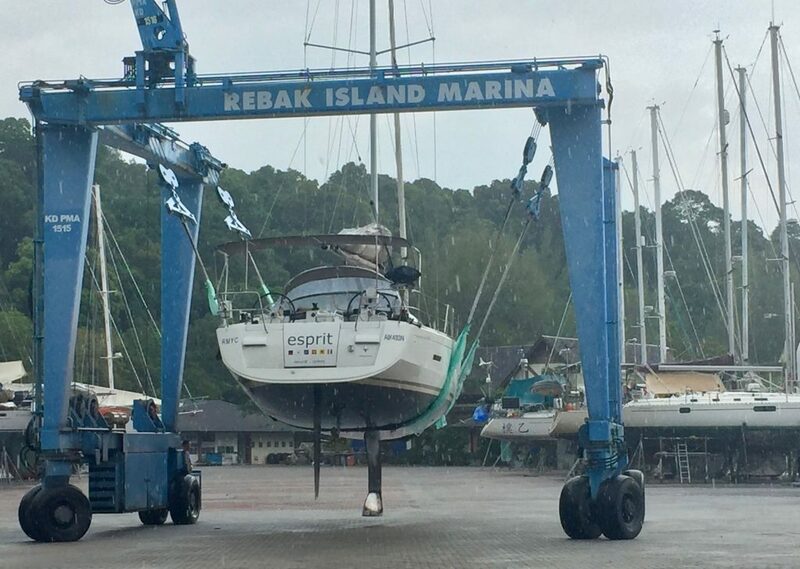 The reason we sailed back for the haul out of Esprit, was that the quote from Rebak Marina for the slip, pressure clean, sanding down the hull, two coats of antifouling, polishing the topsides above the waterline and a comprehensive engine service, was around AUD1,500 less than in Phuket. Grant and Pete, both Aussies, did a fantastic job. Esprit haul out and barnacle scrape off. For our non-sailing friends, a few photos will show the effect of the oceans on a sailing vessel after only 14 months at sea, since the previous haul out. 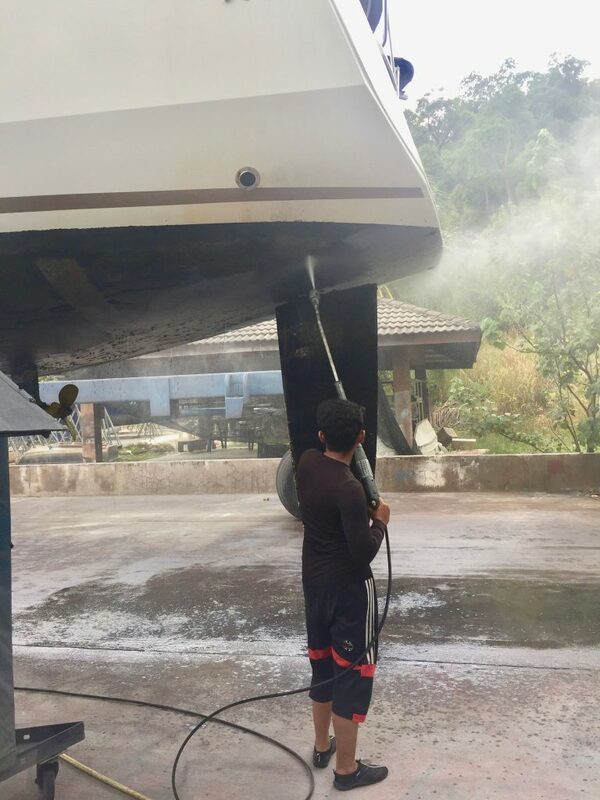 Like a car or a house, a boat requires annual maintenance. Esprit off to her parking bay in the rain. Yanmar leg and prop with worn anodes. 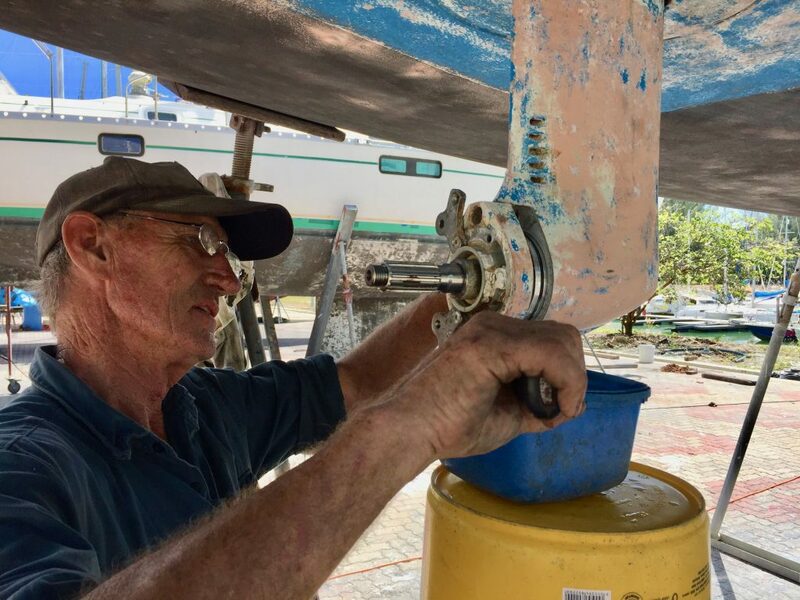 Pete stripping the saildrive leg to drain the oil. 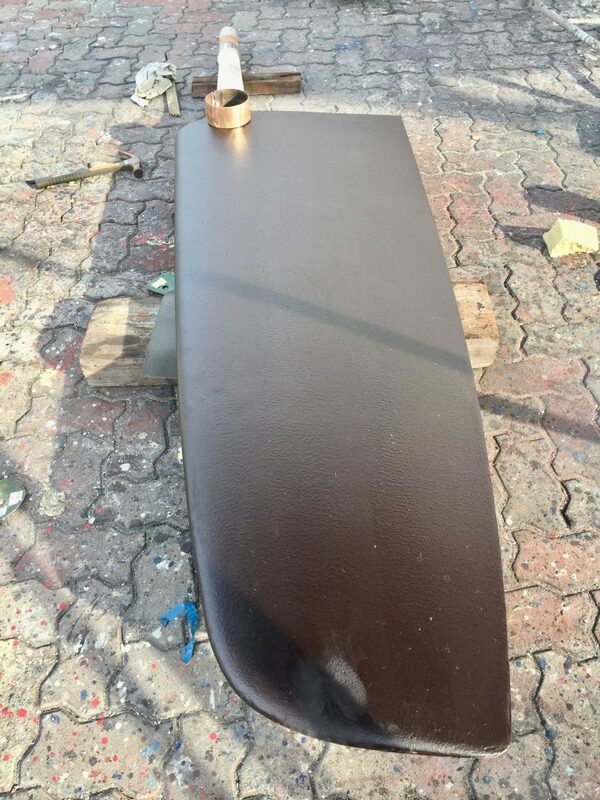 Once out of the water, the 2-metre long rudder showed movement on the shaft, resulting in Grant removing the rudder to have new nylon bushes and brass shims turned and fitted. 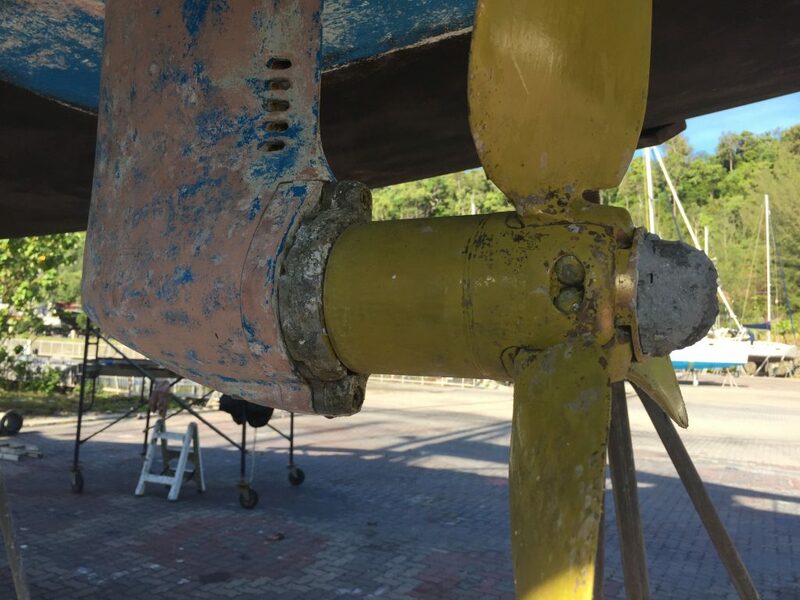 An unexpected AUD 700 remedial exercise, but a precaution against losing the rudder in mid-ocean. The rudder waiting for new bushes. 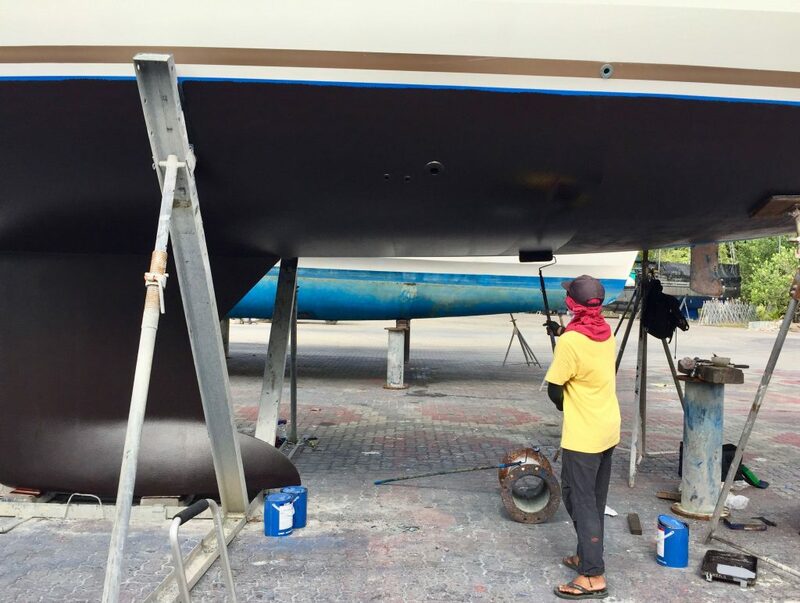 Mr Sahad applying the second coat of anti fouling paint. 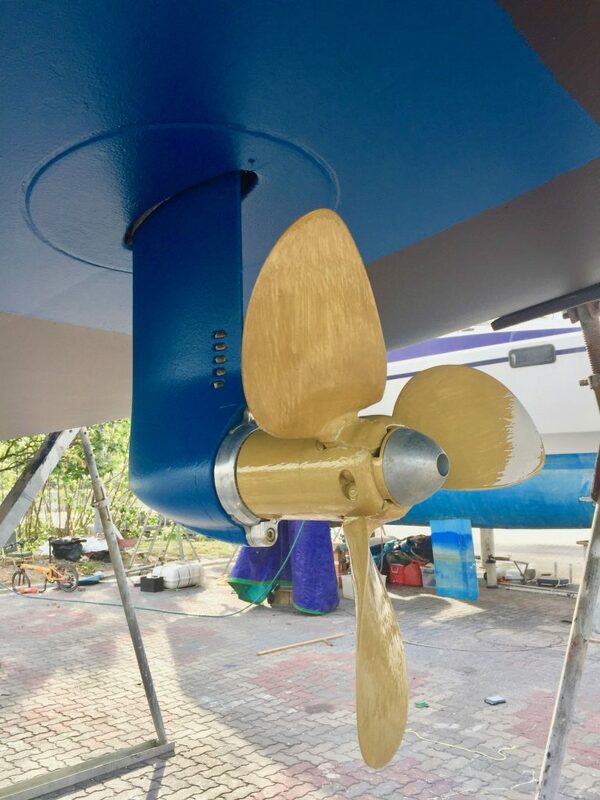 Folding prop with new anodes and propspeed silicone paint. The boat went back into the water after 8 days. We spent this time at a charming beach resort on the main island, taking the free ferry in to Rebak island each day to do work on the boat. 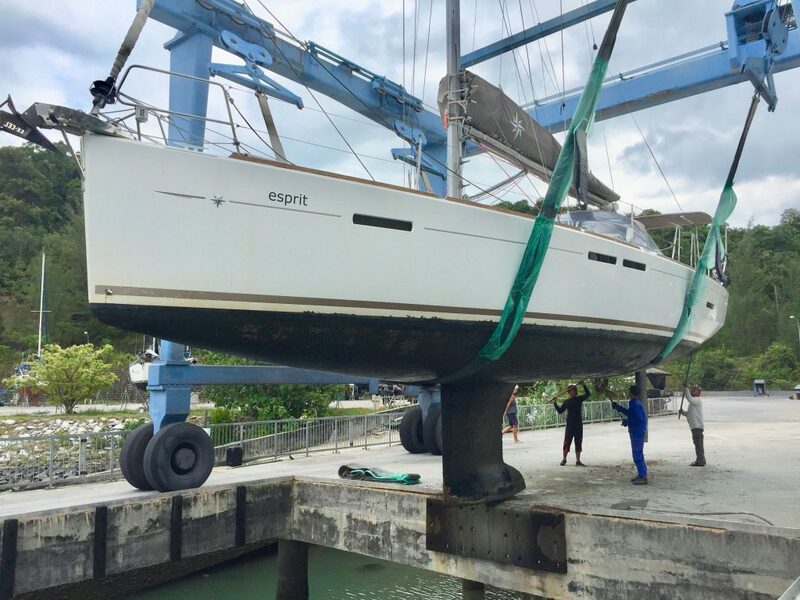 Esprit going back into the water. 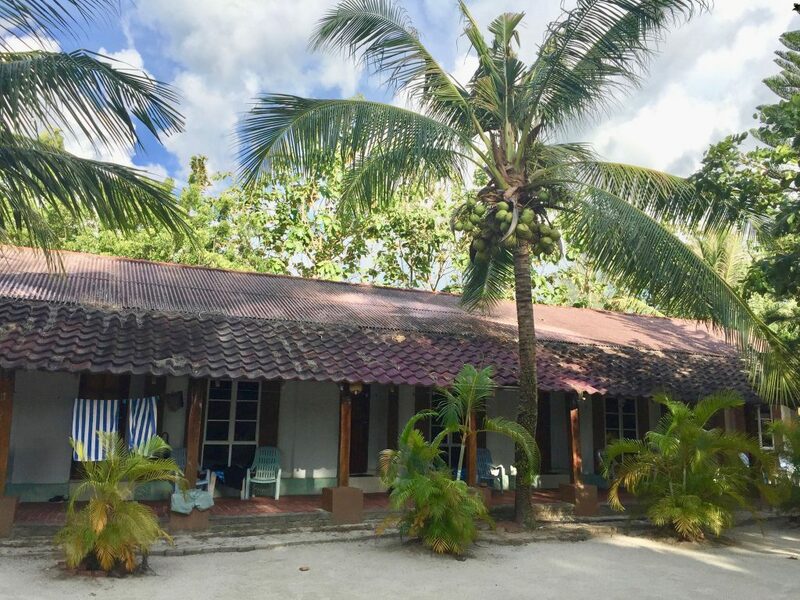 Our wing at Senari Bay. 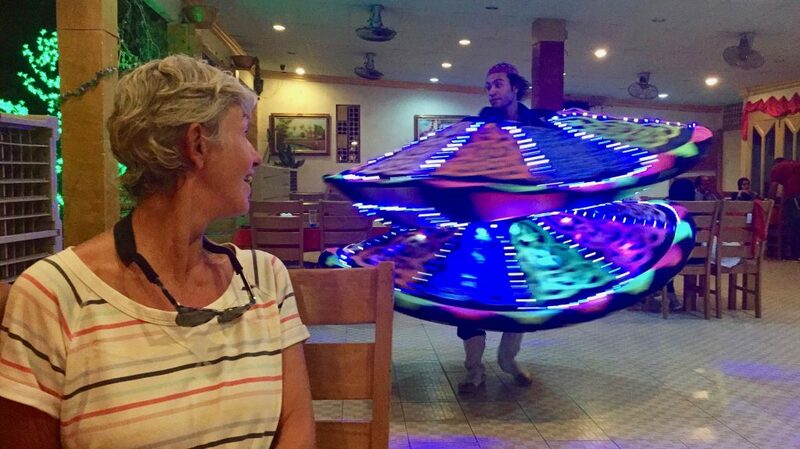 Dancer at the Indian restaurant. 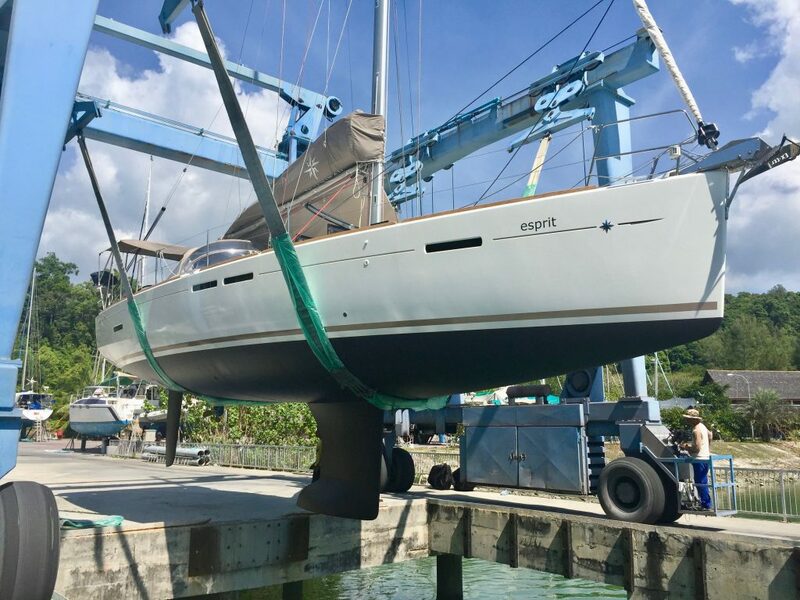 It was a short trip to Telaga Harbour Marina, six miles to the north where we took a berth while Chris Morgan arranged stainless steel welding for the new davit mounts and a frame to carry the two new Canadian Solar panels above the bimini. New solid solar panels mounted above the bimini. The customs and immigration office opposite our berth at Telaga Harbour Marina, has a clocktower which plays a tune and rings the bell every hour from 8am to 8pm. Very quaint. 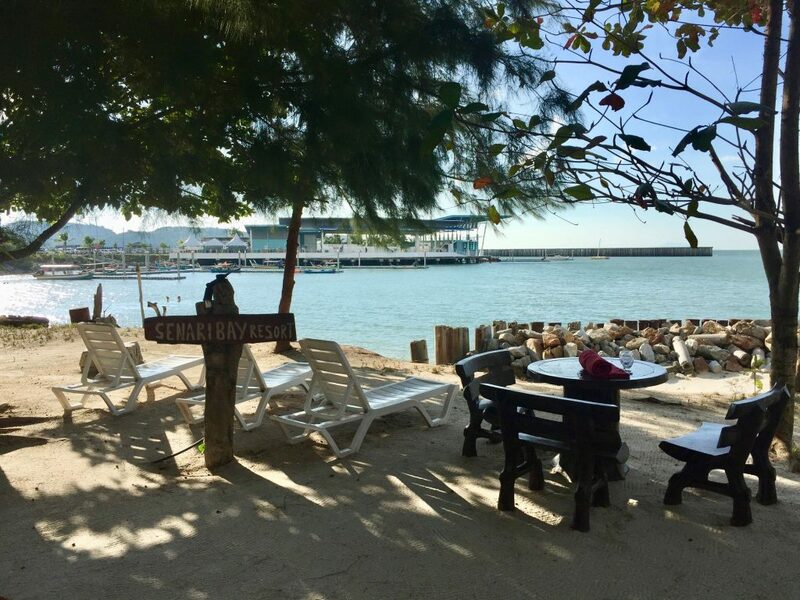 There are a number of restaurants around the marina with reasonably priced food and drink. 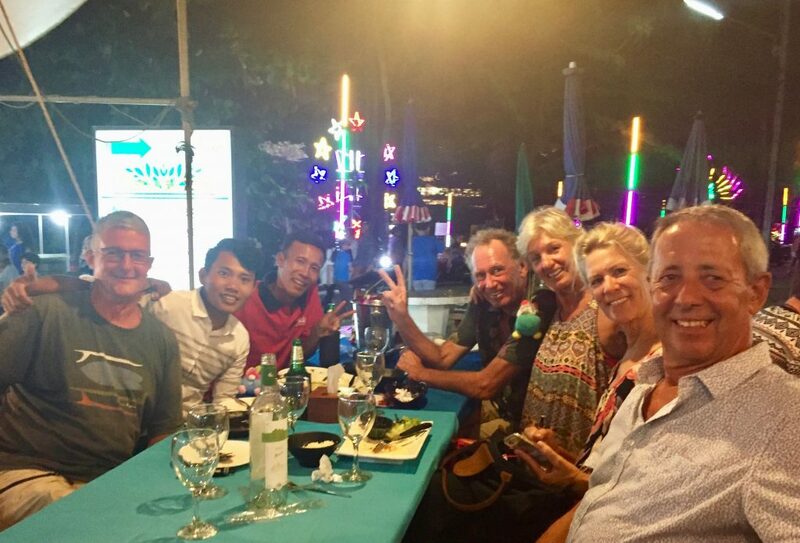 Langkawi is a tax free island, so we stocked up with wine, diesel, engine oil, filters and other tools and spares. Dinner on the marina waterfront. 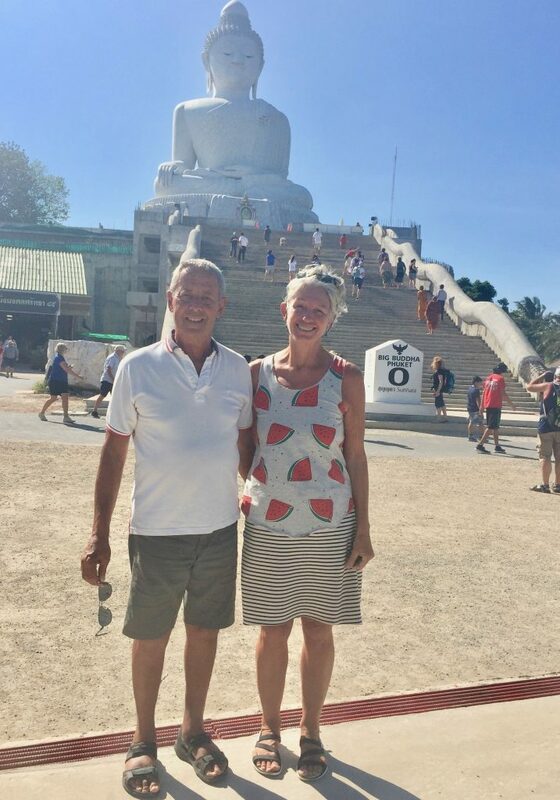 After ten days we sailed back to Phuket, to meet up with Michelle and prepare for the trip to India.